The basic recipe is quite straight-forward, and I whipped it up in no time. There is, as with all good things, a waiting period, but by the time it's ready the weather will be even warmer. A tall cool glass will be the perfect complement to a steamy Tokyo summer day! Soak the plums overnight, drain, dry, and remove the stems. (Read up on the why's and wherefore's of this part over at the umeshu post.) Sterilize the jar using shochu or a kettle of boiling water like I did. 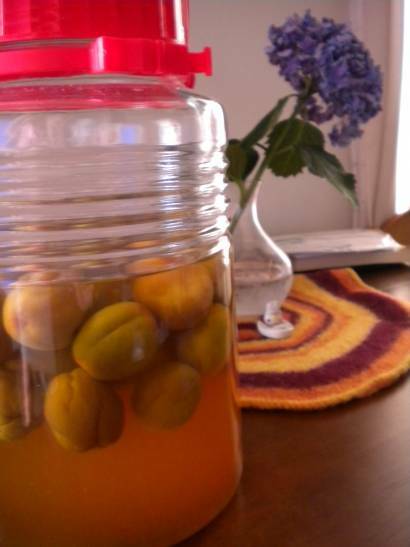 Place ume in the jar, pour in the honey, and pour in the vinegar. Cap and wait three or four weeks. Give it a good shake periodically to help it mix, and to give you an excuse for peeking at it. I put the honey in first, which may or may not matter. I'm thinking, though, that for mixing purposes it might be better to do what I recommended above instead. It's only a hunch, though. When I visit the jar for it's weekly shake, I notice the honey mostly settled on the bottom which may mean poor mixing. Hence, my hunch. As usual, I used a combination of recipes but relied most heavily on this one and notes from my tutor. She used plain old white sugar for hers, and it was super tasty after only a week.